The Palms Casino Resort in Las Vegas is internationally recognized for its exceptional accommodations, high-energy nightlife, extravagant pools and world-renowned restaurants. This Boutique Resort captures all the excitement and energy of Las Vegas in one vibrant setting. Comprising 40- and 55-story towers, Palms Casino Resort is 1 mile west of the Las Vegas Strip, 3 miles from the Forum Shops, and 5 miles from the convention center. Once home to MTV's The Real World, music and dance venues at The Palms include a top-floor bar with 14-foot windows and sweeping city views. Free valet parking is available. 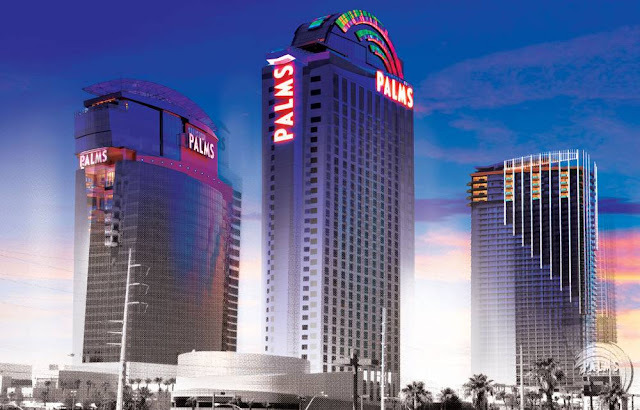 With floor-to-ceiling windows, all guestrooms at The Palms Casino Resort offer free WiFi; beds have pillowtop mattresses, Baltic linens, and down comforters and pillows.